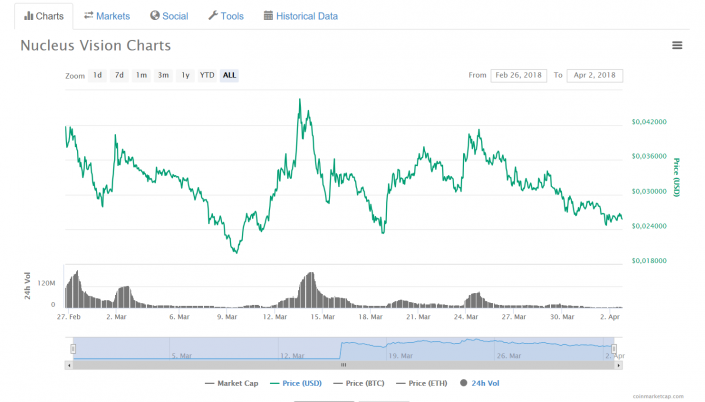 nCash Token for 2018 – Will it Keep Going Down? Home > Hot Penny Stocks > nCash Token for 2018 – Will it Keep Going Down? Nucleus Vision is the IoT and contactless identification system. The token is created for decentralized monetization which uses nCash cryptocurrency to make it possible to conduct transactions across the retail ecosystem. The token’s price at the moment is 0.025913 USD and it is drading with a 3.33% rise against the United States dollar. The Nucleus Vision project was made in 2014 at Harvard University and the token is described as an end-to-end solution. It has been made to provide as they say “customer data to retailers which was previously inaccessible without any risk” according to their papers. The company plans to achieve this IoT idea, by using their blokchcain and real-time sensors technology. This is done by making their platform to aggregate personal information of users In order to customize their shopping experiences via bockchain. Otherwise put, the Nucleus Vision blockchain project aims to make it so that the users are displayed their desired products, based on what they are looking for online. The project has already gathered a large community in platforms and forums, like reddit. In addition to this, users believe that they have over 60 thousand subscribers, of which only few are online, which does raise some questions. nCash has a market cap of around $122 million. The company is among the one hundred best tokens with a position of 90 at the time of writing this, but this is very likely to change son. The supporters of nCash are looking forward to the project becoming an actual digital asset that is usable in order to further invest their capitals. In addition to this, the token has already been listed on big exchanges, like Binance, Koinex, Bitbns and IDEX. Nucleus Vision aims to allow customers to altheer their data sharing settings, so the project is customer oriented as well. In addition to this, to increase trus, they also promise to deliver transparency to their user, allowing them to see how their information is being used. At this point any ecosystem participant is promised to request any data which is collected and declared. In addition to this, the project is also advertised as a Harvard project, and it’s CEO Abhishek Pitty is actually a Harvard dropout. It is likely that the CEO came up with the idea whilst studying there, but it remains unclear whether this will make the project more trustworthy or create futher doubt.